We find symbolism in rare events that coincide with our rare events - a rainbow at a wedding, something as beautiful as a Luna Moth after the loss of a loved one. And that is good - we gain a beautiful visual memory to tie to the emotional memory. As noted below, moths and butterflies are doubly symbolic, as they represent a transformation from mundane to wonderful. Maynard, MA: This morning (May 28, 2013), turning back to the house from getting the newspaper, I looked up and saw this over our front door. It stayed until evening, then flew off. "This" is a male Luna Moth (not 'Lunar moth'); only the fourth I've ever seen in 60 years. Luna moths are native to North America, and not so much rare as secretive. These are forest-dwelling, night-flying, short-lived moths. In New England, adults emerge from pupa in late May to mid-June. The adults do not feed, hence are never seen flitting from flower to flower, and live for only about a week, their sole purpose - besides beauty - being to mate before dying. I suppose it's the same with us, just on a different time scale. In northern states the cycle from egg hatching to egg laying takes a year, with only the last week spent as a winged adult. In central and southern states there may be two or even three generations during the warm months, with only first cycle of adults having overwintered as pupae. Readers from Southern states have commented about sightings as early as February and as late as September or even October. After the overwintering generation has emerged, each subsequent generation takes 9-11 weeks. The males use their intricately branched antennae to detect scent pheromones released by females. The detection system is so sensitive that a male in flight can detect the presence of just a few molecules in the air. He will then immediately turn and fly upwind into the mild night wind, traveling miles on her intensifying scent steam until he finds her perched on a tree branch. Each male and female mate once (a process that takes several hours). The female will deposit several hundred fertilized eggs over the next 2-3 nights. A careful look at the large photo discerns what appear to be faint circles on the upper wing, below and inward from the more obvious oval-shaped markings. Actually, these are brightly colored circles on the underwing. Several large moth species have "eyespots" on underwings. There is a theory that moving the overwings apart to suddenly reveal what looks like large eyes on the underwings might briefly scare away an attacking bird or other predator, allowing the moth time to escape. This does not always work, as evidenced by the photo of dismembered remains found on top of a picnic table. Similar moths (night fliers with green coloring, wing eyespots and tailed underwings) live elsewhere in the world. A search on "moon moth" will yield information and pictures on many related species in Asia, Africa, and one in Spain that as a caterpillar, eats pine needles. The sole North American species is Actias luna. 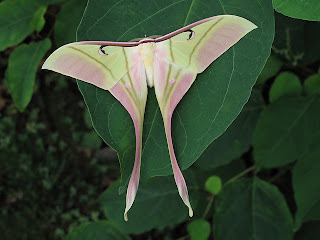 A picture below shows one of the cousin moon moth species native to Thailand. Henry David Thoreau jotted a few notes in his journal, June 1859: "I found a remarkable moth lying flat on the still water as if asleep, they appear to sleep during the day, as large as the smaller birds. Five and a half inches in alar extent and about three inches long...with a remarkably narrow lunar cut tail of a sea green color with four conspicuous spots whitish within then a red line, then yellowish border below or toward the tail, but brown orange and black above toward head. A very robust body covered with a kind of downy plumage an inch and a quarter long by five eighths thick. The sight affected me as tropical and I suppose it is the northern verge of some species. It suggests into what productions Nature would run if all the year were a July. By night it is active, for though I thought it dying at first it made a great noise in its prison a cigar box at night When the day returns it apparently drops wherever it may be even into the water and dozes till evening again." Change. Most common is an anticipation of change - either change your life, or your life will be changed - active or passive. Change. According to one internet posting (its source unattributed) Luna moths are associated with intuition, psychic perception and increased awareness. My own opinion is that sightings are so rare and so striking that whenever we see a Luna moth our thoughts seek out some event in our own life to create meaning. From Bulfinch's Mythology "The Greek name for a butterfly is Psyche, and the same word means the soul. There is no illustration of the immortality of the soul so striking and beautiful as the butterfly, bursting on brilliant wings from the tomb [pupa] in which it has lain, after a dull, grovelling, caterpillar existence, to flutter in the blaze of day and feed on the most fragrant and delicate productions of the spring. Psyche, then, is the human soul, which is purified by sufferings and misfortunes, and is thus prepared for the enjoyment of true and pure happiness." Psyche's story is of a young woman who became the lover of Eros (Cupid in Roman era), who was with her only during the darkness of night. For the forbidden folly of viewing his sleeping body by lamplight, she was tasked by the Goddess Aphrodite (Eros' mother, named Venus in Roman era ) with four near-impossible challenges. Upon completing these, she was given the drink of immortality by Zeus, and rejoined Eros. In art, Psyche is often portrayed with butterfly wings while Eros is shown with feathered wings. Ronald A. Gagliardi wrote a thesis "The Butterfly and Moth as Symbols in Western Art." Much of it can be searched at: http://www.insects.org/ced4/butterfly_symbols.html. There is mention of belief by the Blackfoot Indians that butterflies were bringers of dreams and sleep. Luna moths as symbol for sleep? Sunovian Pharmaceuticals, a division of a Japan-based pharmaceutical company, uses a Luna moth animation in U.S. television and print advertisements for it's sleep-promoting drug LUNESTA. While the moon is often seen as a symbol or bringer of sleep, that effect has not traditionally been attribute to moths. And why should it, when in fact we know they are up all night!!! In The Hunger Games (book, p. 289) a beautiful green-and-silver moth lands on Katniss' wrist. In websites such as http://www.hungergameslessons.com/2011/06/whats-so-important-about-the-green.html much is made of this as a symbol of the transition of Katniss from a self-serving, self-preserving person to one who has empathy for others. Given the story takes place in North America, it could have been a Luna moth, though why "and-silver" is part of the description is anyone's guess. Wings to dead: 1 week. Beauty, beauty, beauty, beauty, beauty. To feel sun, dark, rain, wind. Softly moving inside, always thinking. To become a pale night flyer. Every plant, planted, is a commitment to the future. Some commitments take longer than others. Nut-bearing trees take tens of years to reach good yields. Flowering bulbs, on the other hand, represent a gardener's shortcut. Because commercial bulb growing operations produce bulbs of optimal size, all the gardener has to do is make a hole in the ground, step back, and wait until spring. Tulips are packaged by type to bloom in early- mid- or late-spring. The tulips at the intersection of Summer, Brooks and Maple Streets are mid-spring Darwin hybrids, in yellow, red, pink and orange. With luck and a timely bit of fertilizer they will be back in 2014 and 2015. Beyond that there will be fewer flowers each year, and not as tightly synchronized for height, flower size or timing. By the fall of 2015 they may need to be dug out and replaced. For tulips do not last forever. The ideal soil, fertilizer and moisture conditions that Holland's commercial growers used to grow and export three billion tulip bulbs or tulips for bouquets every year are tedious to replicate at home. Planting in well-drained soil will all but guarantee the first year's bloom. Ideally, the plant's leaves will capture enough solar energy to create a good-sized new bulb for the subsequent year. But in less than ideal conditions the new bulb will be smaller, and the next year, smaller still. These compromised bulbs either put out one large leaf and no flower, or small leaves and a stunted flower. And that is a signal to dig everything up and start over. Know, though, that any set of instructions beginning with "Make a hole in the ground..." is misleadingly simplistic. There are three basic strategies - make a hole for each individual bulb, digging a trench for a row of bulbs, or dig out an entire bed and put in lots of bulbs. My preference is to go big. Because, honestly, a dozen tulips is pitiful. If you buy into making a big impact then purchase 60-75 bulbs of the same type. Next, dig a hole covering eight square feet, eight inches deep. Discard all plant matter, roots and rocks. Set aside for later examination all foreign objects: mysterious animal bones, pottery shards, coins, broken glass, etc. Next, put back two inches of the dirt, add an equal amount of compost (either from your compost pile or purchased) and mix. Firmly press the tulip bulbs into the loose soil about four inches apart. Avoid making rows. Cover with another two inches of dirt and then water copiously. More dirt, then walk all over it to pack it down. Add the rest of the dirt followed by an inch of mulch. All this will take many hours, and many body parts will hurt. Tulips, as is true for many other flowers, have symbolic meanings. In general, a gift of tulips is a declaration of love. Red for true love, with the black of the inside center said to represent the heart of a lover burnt to a cinder with passion. Pink means friendship and affection without the overtones of romantic love. Orange tulip flowers symbolize warmth and happiness. Purple tulip flowers are traditionally associated with royalty - but now show up in bridal bouquets. White tulip flowers are a means of asking for forgiveness, but also represent purity, innocence and respect. So again, brides. Cream-colored tulips confer commitment. Variegated/multi-color tulips are thought to symbolize beautiful eyes because of their gorgeous color patterns, perhaps making the perfect date flower. Black tulips, actually, a deep violet, maroon or wine-dark color, symbolize farewell, or perhaps not-that-into-you, so are NOT the perfect date flower. And then, they are gone. The tulips that maxed out the first few days of May were mostly depetaled stems by the 10th. These are being deadheaded to minimize any waste of plant energy. The leaves will be left alone until they turn brown and wither. By then it will be easy to pull the stems out of the ground, leaving the newly formed bulb to wait until next spring. Expectations are that most of the planting will reappear next year, just not as tightly synchronized for height and timing. May 2014: About 90% of these tulip plantings returned in good health. As expected, there were a few laggards, stunted tulips and no-shows. Timing was two weeks later than the first year, due to prolonged cold weather all Spring. Both years there was one red tulip among the sea of yellow tulips. This was not the result of an accidental planting. In 2014, just before the flowers opened, someone took it upon themselves to remove the red tulip. So sad. Water - How Much to Drink? How much water to drink? The short answer is enough that you pee enough. Our body's water content is strongly regulated to stay very close to normal hydration. There is no such thing as chronic dehydration unless there is also chronic water rationing. Enough water is enough - more is not better - and too much has risks. Water comes from beverages, water content of food, and the metabolic water created by converting food to energy (example: sugar metabolized to carbon dioxide and water). Water loss from breathing, from sweating, and as water content of feces are not under strong physiological control. Instead, urine volume is regulated. Normal urine production is 1,200 to 2,000 ml/day (think 1 to 2 quarts). Drinking more than needed increases urine production - can be 10 liters a day or more. Urine production cannot drop to zero because that is how our bodies dispose of metabolic waste products. Our kidneys can concentrate all the waste into an disposal volume of 500 ml/day, but not much smaller. Drinking more does not dispose of more waste - it just dilutes the same amount into a larger volume of urine. There is debate on what is considered Adequate Intake (AI). The U.S. government, through the Dietary Reference Intakes (DRIs) for water, published by the Institute of Medicine in 2005, decided that men ages 19 and older should consume 3.7 liters (125 ounces) per day, and women 19 and older should consume 2.7 liters (91 ounces) per day. These numbers refer to total water intake (TWI), which includes beverages and water content of foods. The typical split is a tad under 80% from beverages and a tad over 20% from food. Hence, men and women should be drinking 100 and 73 ounces, respectively. The reality here is that the IOM wasn't sure how much water is really needed, so it sort of rationalized that the average intake is an adequate intake. Europe disagrees. The European Food Safety Authority decided in 2010 that an AI for men is 2.5 L and for women 2.0 L. The World Health Organization likes 2.5 L/day for men and 2.2 L/day for women. But keep in mind that the WHO assumes average weights for men and women as being 154 and 128 pounds, whereas the current averages for U.S. adults are 196 and 166 pounds. Adjusting for weight would put the WHO recommendations closer to the U.S. numbers. A old rule of thumb that tries to take into account a need for more water with an increase in calories being consumed (because physical work or exercise requires more calories and needs more water to compensate for sweating and breathing losses) is to estimate water needs as 1.5 ml per calorie intake from food and drink. By this math a sedentary person taking in 1800 calories would need 2.7 L, whereas a larger and/or more physically active person consuming 3000 calories per day would need 4.5 L.
There is no evidence that drinking more reduces risk of dying. This from a study that tracked 12,650 people for 6.7 years. What it did was look at how many people died in the lowest 25% for water intake (they averaged 1.75 L/day) and compared the three higher quartiles to the lowest. No statistically significant differences among the four groups. Higher total water intake does reduce the risk of getting kidney stones. Higher total water intake also reduces the risk of exercise-induced asthma attacks.The evidence for weight management is iffy. Drinking water 30 to 60 minutes before a meal reduces calories eaten in that meal. There is evidence that when water is substituted for calorie-containing beverages, total calories per day decreases. In a large epidemiological study, people who drank more water weighed less. But as water consumption might co-occur with other lifestyle choices, it is not clear if the water intake was responsible for the weight difference. Evidence for health benefits beyond those mentioned above is either weak or contradictory. Dehydration will increase the risk of constipation, but for adequately hydrated people, drinking more water will not alleviate constipation. The idea of more hydration improving skin health has not been proven. There is inconsistent data for more water lowering the risk of bladder cancer, colon cancer or urinary tract infections. Short-term, dehydration and overhydration are easily achieved, with potential for serious consequences. People doing vigorous physical activity can lose a quart an hour via a combination of perspiration and the moisture of exhaled air. A review of 2,135 athletes who had completed endurance events found that 50% had experienced more than a 3% weight loss. Given that we are 60-70% water, that is roughly 5% water loss. It is well documented that body weight loss of more than 2% is known to compromise exercise capacity and mental function. The same study reported that 11% were overhydrated. i.e., weighed more at the end of the event than at the beginning, and one-tenth of those had symptoms of hyponatremia (low blood sodium). When so much water is consumed that sodium in the blood is diluted, water moves into cells, resulting in swelling. Puffy hands, ankles and face seem harmless, but brain cells also swell, increasing pressure. Symptoms progress from headache and nausea to stupor, seizures and death. Sports drinks contain some sodium, but not enough to prevent hyponatremia if consumed in excess. For some people, vigorous exercise shuts off urine production even if they are overhydrated. This can persist for hours after exercise ceased. If under the mistaken belief that they are dehydrated because they are not urinating, and then they drink more, this exacerbates the problem. It is essential to do a body weight check before an endurance event and at the end. If weight has gone up, do not drink anything. If weight has gone up a lot, get to medical care quickly. As easy way to understand the impact of water on body weight is to weigh oneself just before going to bed and second thing in the morning (after a morning pee). Most people find they are 1.5 to 3.0 pounds lighter in the morning. If that were true body weight loss it would represent 5,000 to 10,000 calories expended (using the loose rule of 3,500 calories per pound), whereas the real estimate of calories burned while at complete bed rest for 7-8 hours is more on the order of 500 calories. So most of that weight loss is from water as urine, breathing out moist air, and water loss through skin. That last occurs even it not noticable as perspiration. The intestinal tract contains water. Food takes several hours to get from the mouth to the start of the large intestine. At this point the water content is quite high, as in addition to the water content of the food and whatever beverages were consumed with the food, the salivary glands and stomach and small intestine digestive secretions contribute at least a quart more. Once into the large intestine more than 90% of the water is recovered/resorbed, but at any time the large intestine contains 2.5-5.0 pounds of feces, with 75%-90% of that being water. Normal bowel movements are about a half-pound a day of which about 70% is water, but severe, prolonged diarrhea can be dehydrating because the large intestine did not have an opportunity to recover water.